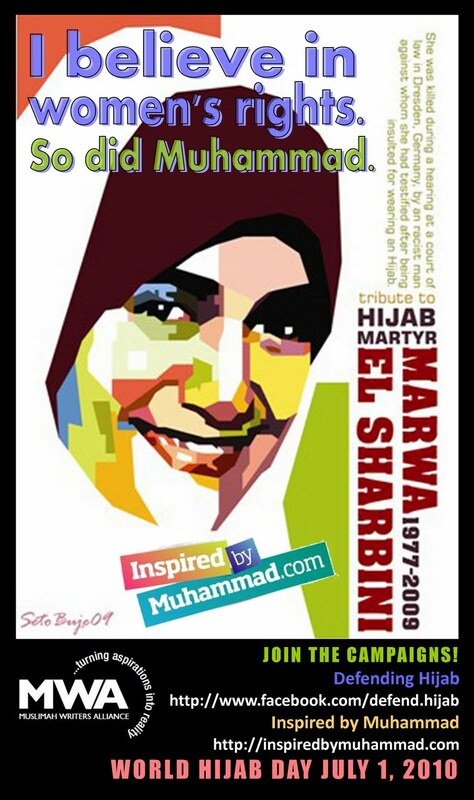 The brutal killing of the pregnant Marwa Al Sherbini, 32, raised a lot of questions about the rise of right-wing fanatics in Europe. Al Sherbini was stabbed 18-times by a German man of Russian descent, formally identified only as Axel W, as she was about to give evidence against him as he appealed against his conviction for calling her a "terrorist" for her wearing the headscarf (hijab). The war on Hijab (Muslim head covering and dress code) and Niqab (full body and face covering) is not just a war against Muslimahs and the global Muslim community. It is a war against women, and women's rights. For centuries and centuries women have struggled against oppression - and finally today, in most countries worldwide, we have constitutional rights that protect us. The recent legislation drama in certain European countries, with regard to the Niqab and Hijab, represents a direct attack on women's rights. As women, we need to realize that this is a war against US. No one else is going to fight it or stand up, unless we do! A woman with rights is a woman who may dress however conservatively she likes in public. No man can tell a Free woman to de-robe! This is an appeal to appeal to all women, of all faiths, to stand up for Women's Rights, and for the rights of women that anti-Niqab and anti-Hijab legislation may affect. Join the Facebook campaigns! These pages and information are not only for women who wear Niqab (or Hijab), they are for all women who believe that their right to cover should be protected and upheld. Well said, sister Aishah. You put it excellently. Baraka Allah feeki!